Well today was the day we racked the mead….that is, we transferred it from the one container to another. After two weeks, the specific gravity had dropped from 1.050 to 1.001. It was great to see a drop, because we hadn’t actually seen much fermentation going on. We decided to leave it another week as the weather had been very cool which had likely slowed the primary fermentation down. The following week, the SG had dropped to 0.999, so we decided to proceed with the racking. 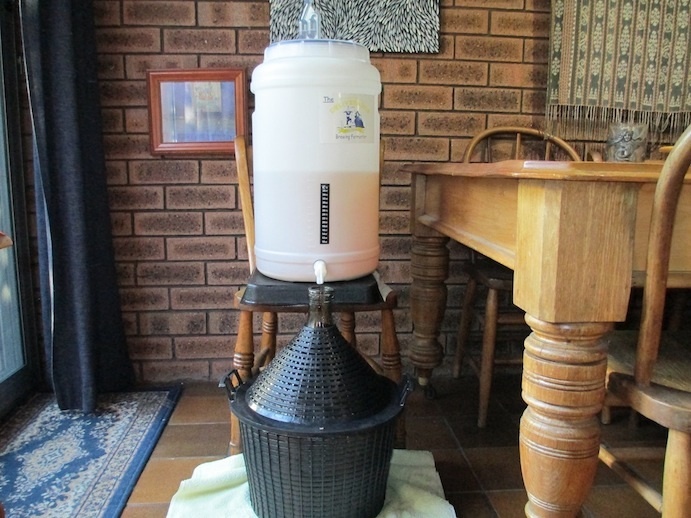 The glass carboy was sterilised and well rinsed, then placed on the floor below the tap of the primary fermenter. The tap in the primary fermenter is placed to allow the must to flow, but leave behind the lees, or sediment sitting on the bottom. Once the transfer was complete, the stopper and airlock were put in place, and the carboy moved to the cool produce room to continue fermenting and clearing!